What does 'R' signify in share trading? 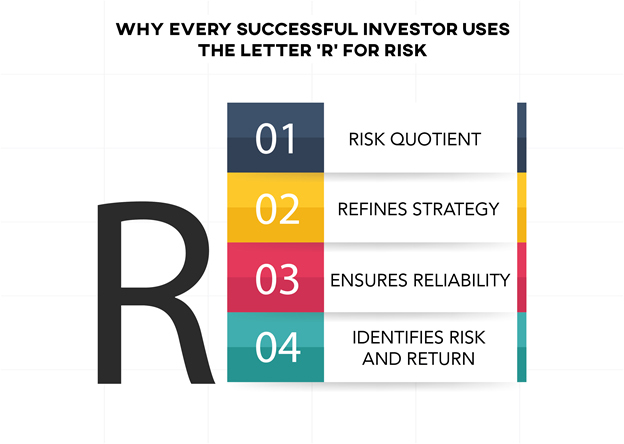 The concept of defining risk as 'R' can go a long way in allowing an investor to simplify his/her investment process. When you trade in the share market, there is one thing for sure which never changes; you have to risk a lot of your hard-earned money to earn a profit. Moreover, it can become really complicated for investors to keep tabs on his/her returns or losses if they initiate multiple trades. The concept of defining risk as 'R' can go a long way in allowing an investor to simplify his/her investment process. Look at the information below to further understand how you can trade successfully by defining risk as 'R'. 'R' stands for the amount of risk you take during a trade. Technically, it is just another way of looking at a profit and loss ratio. Look at the following examples to understand the ‘R’ concept of trading. You purchase 100 shares of a company at Rs100 per stock and put a stop loss at Rs97. Your risk amount, in this case, is Rs300 (100x3), and Rs3 (risk amount per share) is referred to as 1R. If the stocks fall to Rs97 per share and are sold in the market, you lose -1R, i.e., Rs3 per trade - a total of Rs300. Alternatively, if the share price rise to Rs106 per share, you will gain Rs600 in full, and the trade will be a +2R winner, i.e., Rs6 per share. Let's say you bought 10,000 shares at Rs100 per share and put a stop loss at Rs97. Your total risk amount, in this case, is Rs30,000, in stead of Rs300, but it is still 1R, as the risk amount per share is still Rs3. When you translate your risk in terms of R, you open yourself to an easier and more effective share market strategy. This increases your ability to manage your positions. By using the concept of R, you can easily and quickly identify the risk for each of your trade. For example, let's assume that you put the same amount of money, i.e., Rs10,000 in each of your trade. You buy the shares of company ABC trading at Rs200 on the market and put a stop loss at Rs150. This will allow you to buy 50 shares of the company. Your total risk amount would be Rs2,500, and Rs50 (risk amount per share) is our initial 1R. At the same time, you invest Rs10,000 in another company XYZ, trading at Rs100 even and put a stop loss at Rs80. It will allow you to buy 100 shares of the company. Your total risk amount would be Rs2,000, and Rs20 (risk amount per share) is our initial 1R in this case. This is where you will find the concept interesting. Let's say both the stocks rise 5% in their price. The ABC trade would yield Rs500 as profit as the price will become Rs210 per share (50x10) and the trade from the XYZ company would also yield Rs500 as profit, as the price will become Rs105 per share (100x5). So when we look at both of our trades, we made Rs500, which is 5% more than the price we bought the shares for. This must be great news, right? Both trades differ to each other as you risked Rs2,500 with ABC company to make Rs500. When we apply the concept of R here, our return is 0.2R. With company XYZ, where you risked Rs2,000, your return is 0.25R. A difference of 5%. Now imagine making hundreds of trades without using the concept of R. Wouldn't it make things very complicated? When you use the concept of R, you can figure out how similar-looking returns differ drastically. The last piece of the puzzle in calculating 'R' is to determine the overall success of any given strategy. With all of your trades tagged and marked with the strategy used in the trade, you can quickly figure out real trade results. Take all of the ‘R’s for a particular time, sum them up, and you will have the net 'R' for a specific strategy. If the result is in positive numbers, the strategy is working, if negative, you should consider changing it with a better strategy. Either way, the concept of 'R' can prove to be a useful tool when you want to improve your trading process and should be considered by every investor trading in the share market.